The harbour started life as a jetty, all remains of which are gone. There was a simple timber quay by the 13th century and by 1580 the south jetty had been built using huge boulders piled 35ft high. To the north a pier was added between 1703 and 1750. This created the Old Harbour, now the Victoria Marina, lined on the landward side by old warehouses which have been converted into shops and offices along the sea front. 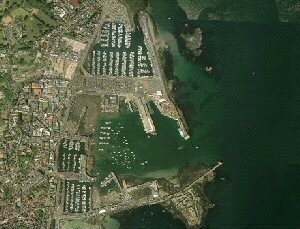 The larger main harbour was built in successive schemes between 1835 and 1909 incorporating Castle Cornet, which dominates the south breakwater leading into the port. Since then, the New Jetty with its passenger terminals and the wall of the Albert Marina has been added. The most recent of all is the Queen Elizabeth II Marina.